It's Perceptual Style is the way you take in information through your five senses and make that information meaningful to you. Your Perceptual Style acts as a filter between sensation and understanding. It's at the core of who you are, and it impacts your values, your beliefs, your feelings, and your psychology. The decisions you make, the actions you take, and the directions you choose are all influenced by your Perceptual Style because it defines reality for you. The key to your success is understanding your Perceptual Style. The Recognized Strengths Profile Assessment builds on YOUR Perceptual Style Assessment results and measures exactly which of your core strengths you are claiming and using, which are lying dormant, what skills that are not part of your natural repertoire you've worked hard to acquire, and how you prefer to interact with people. It gives you a point-in-time map of exactly where you are on the road to claiming and using all of your natural strengths. Imagine what you can accomplish in your life when you have the perfect map to help you make the right choices and maximize your opportunities and effectiveness. Effective leadership isn't about a single set of characteristics or mimicking a single "correct" style. It's about maximizing your natural leadership strengths (and you do have them!) and mitigating your blind spots in a manner that is totally true to who you are. The best way recognize and claim your leadership strengths is through the scientifically developed, Internet-based Leadership Strengths Profile Assessment (LSP). The assessment takes 10 minutes, and if you are interrupted, you can save your answers and continue at a later time. The Perceptual Style Assessment (PSA) is a powerful, one of a kind, scientifically accurate assessment provides you with the information you need to recognize and fully claim the strengths and talents that are uniquely yours. 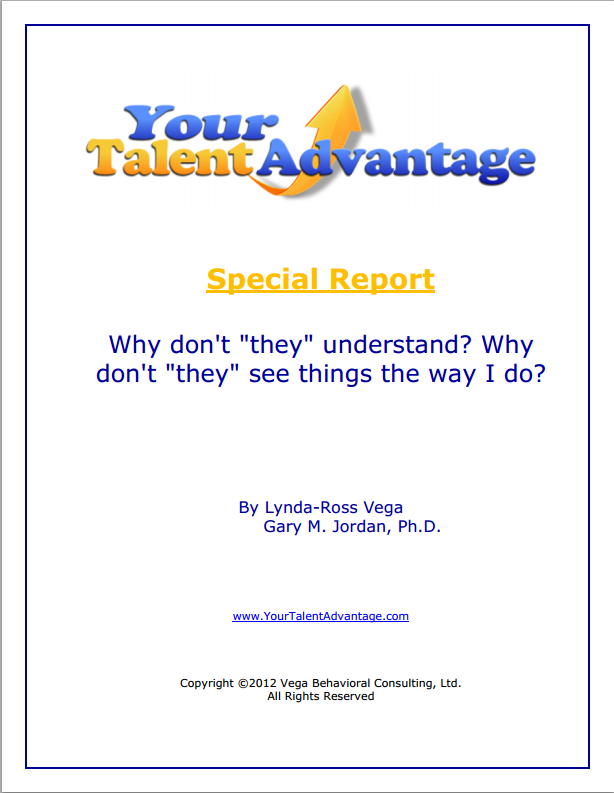 As part of the Your Talent Advantage Owner's Manual series, it enables you to put your natural strengths to work in all aspects of your life. The Recognized Strengths Profile Assessment is truly one of a kind. It builds on the results of your Perceptual Style Assessment (PSA) and measures exactly which of your core strengths you are claiming and using, which are lying dormant, what skills that are not part of your natural repertoire you've worked hard to acquire, and how you prefer to interact with people. It gives you a point-in-time map of exactly where you are on the road to claiming and using all of your natural strengths. The Leadership Strengths Profile Assessment is truly one of a kind. The LSP is actually a subset of the more comprehensive Perceptual Style Assessment and is focused on leadership traits. There's a one-to-one relationship between Leadership Strengths Profile and Perceptual Style - the 6 Leadership Strength Profiles each relate directly to one of the 6 Perceptual Styles. Why don't "they" understand? Why don't "they" see things the way I do? We’ve all been there, attempting to prove our point and convince someone that we are “right,” with no success. The trouble is we often assume there is only one objective reality that everyone is more or less aware of it (if they are paying attention). And that's just not true. Simply provide us your name and email address to download this valuable document. Google the word “leadership” and the search will return over 300 million results. Clearly, leadership is important to us. As humans, we seek it out, “know it when we see it,” and rely on it to thrive and succeed. This is true at every level of society, from your average K-12 classroom to national politics, but nowhere more so than in the workplace. Whether you run the corner cafe or an internet marketing empire, if you're in business and want to be successful, you must know how to lead. Your success in every facet of your business relies on how effectively you lead. We all know that people are different. But just how different is an important question..
After all, those differences impact every area of your business--from the way you communicate with your clients to the way your team works--from the way you judge risks and evaluate opportunities to the way you prioritize your day. Understanding differences can offer significant returns in building a business. Check out this free report to learn more! Not all style theories or behavioral assessments are the same! Perceptual Style Theory (PST), which is the basis for all of the Your Talent Advantage assessments and programs, is a unique new contribution to the field of type and style theories. In this white paper, PST is compared to seven other currently popular and available theories and assessments such as the Kolbe, Clifton StrengthsFinder, DiSC, the Myers-Briggs Type Indicator (MBTI), the Keirsey Temperament Sorter (KTS), and the Enneagram. All of these systems were designed to help individuals understand their own and others’ behavior, and in so doing increase the individual’s effectiveness in the world. However, each system approaches the issue differently and each measures different aspects of human personality and behavior. If you are interested in just what each assessment is measuring and what the theories are that these assessments are based on, you'll want to read this white paper.